Now that the whole truth, and nothing but, is out ...is there a chance now for you and me? I enjoyed the word play on "swearing in" in court (made even better by the fact that he is picking her up after work at the courthouse). Sometimes the most effective way to push an idea is to juxtapose the delivery with the character. Here a powerful, intelligent, driven young woman needs to convince her boss not to miss out on a personal opportunity. So she tells a story from her own life and ends it with the line above. To punctuate the tale with that line works because the person hearing it is a billion dollar business owner. The casual language strikes at the heart of the individual and slips past the professional barriers. This is an adaptation of a 2,000 year old story from the middle east. It is the first short I've produced purely for practice/art and not for a class, festival, or my free film school. Brent's Back has similarities to Applejack and the scene Needle Pulling Thread in that I am working to bring ancient stories into modern contexts. All three were shot very quickly without lighting equipment or--apart of Applejack--microphones. These are examples of what I have been able to do with zero-budget film making. [NB: Always get your cast and crew food.] Most of the actors have never formally performed or been trained. The idea for Brent's Back started one Sunday morning when everyone else was singing in church and I felt like I was an outsider. But I got an image in my head of being at a party where the host has left a space for me next to him but I don't feel like joining in. I realized that the story fit well with the Prodigal Son (Luke 15:11 and following). I felt exactly like the older brother would have felt. I quickly got a draft written and sought out a bit of feedback. Hearing my idea, several people--including my dad--mentioned that my story lacked the historical context (Luke 15:1-3). The story lacked impact because it was missing its catalyst for meaning. I got some push back from this idea because people felt like this was too strong. They recommended that I use something a bit less aggressive, like, "homosexuals and abortionists" or something. Similar thoughts had crossed my mind, but in today's culture, abortion and homosexuality are not culturally sins. It would work for a conservative Christian audience, but I'm publishing this to YouTube. I had to push further to find groups whom the majority of the audience would agree it'd be unwise to spend time with "those people." The story suffered from another cultural barrier: None of the original "shock value" elements evoked any kind of response. Pigs? Refusing to come inside? Even the idea of disrespecting your parent has lost impact. So I needed a way to bring these uncomfortable themes into a day and age when few things make people uncomfortable. The solution I uncovered was to make the father figure into a knocked up teenage girl. This left her character vulnerable, open to cultural pejoratives, and in an awkward space stuck between two competing ideals: grace and healthy boundaries. The older brother could come in and--legitimately--blast her for being inappropriate and foolish. Having the older brother take care of the girl also allowed me to hint at a few other themes and ideas easily missed in the original story. For example, the fact that the money blown on the party was technically the older brother's. I originally spelled it out in the script, but cut that segment of dialog because it wasn't super clear and didn't help push the story forward; you can see me act out the moment to the cast and crew at 2:14 in the BTS video above. For all the thought and agony put into the script, I did almost no pre-production. The film suffers for it. I couldn't get a cast or crew together. My friends are all very busy and a few of them had to bow out. This made planning almost impossible. I eventually just had to choose a day and hope people showed up. The day before we filmed, I still wasn't sure who was going to play a few key roles. It was terrifying. That stress, unfortunately, discouraged me from actually doing the work of pre-producing my film. When we got on set, no one knew the script, what--exactly--we were filming, or what I needed them to do. I was hoping to shoot from 8pm until, perhaps, 11, but that was overly ambitious. The script was seven pages long and I think we had a total of 22 people on set. We got our first shot at 8:30 and wrapped the last shot at midnight. Not too bad, all things considered, but I was over-the-top stressed the whole time. This was not helped by the fact that I couldn't get my microphone to send a signal to my camera right before we started filming. So after 30 minutes of fiddling with it, and getting behind on our shoot schedule, I decided to just record audio straight off the camera. This was incredibly frustrating, so much so that I didn't even bother to turn off the refrigerator, further compromising the audio. I added the party music in post, and used an EQ filter to pull out most of the highs to give it the bass-y "outside" sound, and then removed the filter when I cut inside. When the music starts up again at the end, I had trouble deciding where the sound was "coming from"--was it outside or playing inside? Realistically, it should have been coming from outside, but the sound before had been inside. So, I played with it a bit and covered up the problem by starting a new song when Cal goes to the window. There is, of course, much more to talk about with any production, but I'll stop there. If you have any questions, let me know! The movie-turned-morality-play may be incredibly disjointed at the end--and far too on the nose for my taste--but this sequence is jarringly sober. The lighting (stark and unhappy), set design (nasty motel), costume (it's still unzipped), hair (violently tussled), and the scene in the hospital that follows are spot on from a story-telling standpoint. This line of dialog is killer: "I lived it up. Why didn't I die?" Freesound.org is a wonderful place for young/poor filmmakers like me. You can find so many amazing audio files available for free download. It's fantastic. If you're looking for foley, ambient sounds, specific sound effects, or other bleeps, boops, or booms this is a great source for free sounds. I'm certainly no audio expert, but as I create sounds for my productions I'll share them with you. If you have any sounds you need, let me know and I'll see what I can do. I'd love to have a huge collection of free, public domain sound effects for you to use. I saw one of the best shorts I've seen in a long time last night. It's two minutes of brilliant--if gross--humor and philosophy. Unfortunately, this short was the opening scene to a full length film that failed to deliver on the start. Sad times. Though, this happens often. For horror fans, there really isn't a better option for discussing Theseus's paradox. So, if you're inclined, check out the embedded video. Not sure how long it will stay up as it is copyrighted material. This video is brilliantly cut. The shots fit the tone of the piece, The acting/editing pulls you along in both the song and story. I really wish there was a behind the scenes for this because I think we could learn a lot from how they got the performances that they did and how they enhanced them with the editing. This video exemplifies really well the idea that you can have your actor just sit there with a neutral face and change the mood of the piece by cutting to various things. Editing is powerful. But you need good material to begin with too. My wife went a huge Lumineers kick after seeing them live at Coachella on YouTube. I have a ridiculous amount of sick days! The new Aside category here will bring you snippets from scripts that catch my ear. It could be anything from a clever line to a powerful insight to a well-communicated moment. In this case, it's communication. This character is afraid of forever being sucked into a world where he only does what others expect of him. This simple line communicates that idea perfectly without coming out and saying it. There are many opportunities to use the everyday things around us to get really cool shots for our films. Keep your eyes open. The edit was perfect. But it's not just the cut. The framing--placing him a little lower in the shot, pressed against the wall, watching from the shadows--just screams suspicion. It's perfect. Later in the episode, our hero realizes that his friends could be in danger. He drops everything and runs back to the lab. The animators switched to a scribbled, hurried, high-contrast style while he tore through the city in a mad panic. There are so many tools at our disposal as filmmakers. 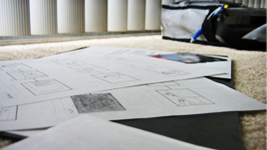 Keep in mind things like framing and shot style as you work on your next project.